VILLA SEGALE is an historical stone country house dating from the 11th century, strategically located on the charming hills above Lucca. Its privileged position allows his guests to discover all the most important areas of Tuscany and Liguria (Portofino and Cinque Terre). 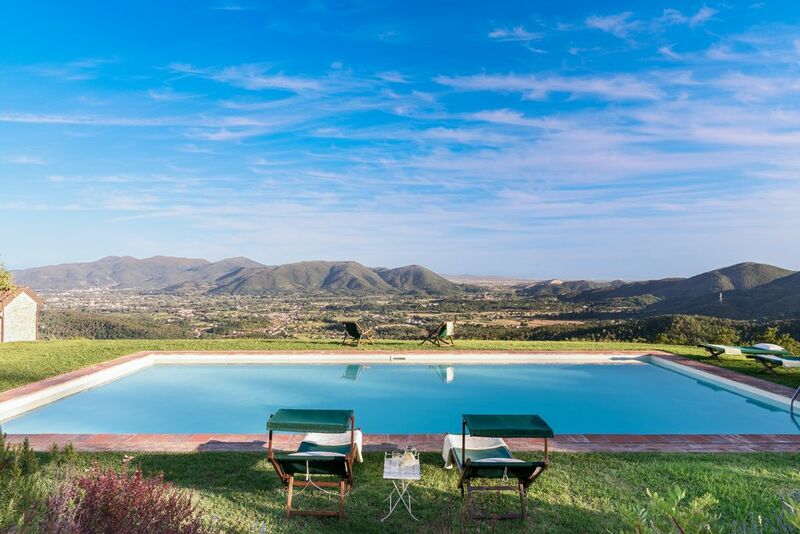 THE VILLA (5.000 ft² - 450 m²) ENJOYS AN UNRIVALED PANORAMA - almost certainly the best of the whole Lucca area - and it is SURROUNDED BY 80 ACRES (32 HECTARES) OF PRIVATE LAND, including VINEYARDS and OLIVE GROVES. - 6 gorgeous panoramic air-conditioned bedrooms: five spacious, elegant bedrooms with stylish en-suite full bathrooms at first floor + one elegant and cozy bedroom with full bathroom (not en-suite) at ground floor. - 80 Acres (32 Hectares) of private land, a good portion of which are vineyards and olive groves that ensure an outstanding and exclusive sense of privacy. - Independent Air Conditioning in all six bedrooms. - Peace. Beauty. Tranquility. Freedom. Absolute sense of privacy. - 2 Panoramic Verandas (first one with big stone dining table and BBQ; second one equipped as 'relax zone' with sofas). - Panoramic Big Swimming Pool (14 x 7 meters) treated with 'Nature2', the best system for water treatment. - Maid Service 3 times per week included. - House Manager that welcomes guests at their arrival, explains the villa and helps with organization. - Free Wireless Broadband Internet. Also in the Pool Area! - Net Screens on all the Windows (removable). The villa, with its 450 SQUARE METERS, sleeps up to 12 PEOPLE and was beautifully restored according to the highest standard and comforts. The ground floor is huge with a large entrance, a sitting room with fireplace, a formal dining room, a large fully fitted kitchen, a small study with a high definition satellite TV (with blu-ray player and a private movie collection), an elegant and cozy air-conditioned bedroom with joinable twin beds (if joined they form a comfortable queen bed), and a full bathroom. Two big panoramic verandas – the first one for dining, equipped with a stone BBQ and a spacious stone table, and the second one for relaxation, equipped with outdoor sofas – complete the ground floor. On the first floor there are five air-conditioned bedrooms with en suite bathrooms: two of them are queen-bedded and are considered the magnificent master bedrooms; the other three bedrooms come with joinable twin beds (if joined they form a comfortable queen bed). All bedrooms are spacious with tasteful furnishing, ample wardrobe space and have large open windows overlooking the charming valley and enjoying the same spectacular view characteristic of the house. The furniture dates back to the 19th century and was purchased in antique shops in the area of Tuscany. The wrought-iron comfortable beds were all handmade by one the greatest craftsman in Arezzo. Moreover, the Villa is completely floored with ancient mezzane, while ceilings have been restored with ancient chestnut beams. These are just a few examples, since only ancient original materials were used in the renovation process, in order to completely preserve the authentic Tuscan tradition of this unique magical place. The location of Villa Segale is magnificent. Perched among green and forested valleys west of Lucca, SEGALE IS SURROUNDED BY 80 ACRES (32 HECTARES) OF OLIVE GROVES AND VINEYARDS. Such an uncommon spectacular area allows plenty of space to wander and enjoy the peace and tranquility of the property’s extensive grounds. Hence guests can join the natural unspoilt surroundings and admire the local fauna such as owls, birds, hawks, hedgehogs and fireflies. The spectacular view across the valley towards the Renaissance monuments of the cities of Lucca and Pisa is to die for. Thanks to its exclusive position, on a typical clear day guests can admire the valley below and the whole landscape up to 40 km around. On the clearest days also the sea of Livorno can be seen. Photos cannot portray the powerful details of such an exceptional view which is recognized as the most stunning in the whole area of Lucca. I am a doctor, who inherited this beautiful place almost 10 years ago. After generations this wonderful place 'arrived' to me and to my family, and we've immediately felt in love with it! This is a truly unique place and that's the reason why I love it so much. Considering today's standards, it's almost impossible to still find places with similar attributes: a fascinating hystorical stonehouse surrounded by 32 hectares of private land - including olive groves and wineyards - immersed in a complete sense of privacy and tranquility. At the same time being so close to Lucca city (9km) as well as to other many fascinating places. This place is a truly hidden pearl ! Enjoying the most beautiful panorama of the Lucca area and living inside a traditional 11th century stonehouse that has been carefully renewed at the highest standards, while keeping completely intact the fascinating Tuscan tradition. The location of the villa is also unique: it grants a strong sense of privacy and allows its guests to enjoy a real natural and regenerating experience. At the same time the strategic position - just 9 km from Lucca city - allows guests to visit all the beautiful cities and places of Tuscany (and also outside Tuscany) with day trips. All Bedrooms are Air-Conditioned. Each bedroom has its unique remote control for choosing the preferred temperature. Two Large Panoramic Verandas: one with a big stone dining table and BBQ; second one equipped as 'relax zone' with sofas. Both verandas are big, comfortable and enjoy a spectacular unique view. Enjoy your staying with: - A house manager that welcomes you & help you prior and during your staying. - Maid service 3 days (3 hours each day) per week. - Cleaning before and after your staying - Air Conditioning - High speed WiFi broadband - Big Panoramic Pool - Ample bed linen, pool towels & bath towels provided (and changed each week, if staying more than one week) - Water & Electricity included - Cot & high chair, on request (for free) - Net Screens (removable) on all the windows of the house. - Ping Pong Table (Table Tennis) -Private chef/cook: available on request (to be paid - not included in price). Everyone we encountered during our stay was delightful and accommodating from the owner of the villa to the house manager to the cooks we hired. The villa is beautifully appointed and comfortable, and the surrounding area is breathtaking. We had dinner at the villa several nights to avoid the 10-15 minute drive up the narrow road in the dark, but the cooks prepared amazing dinners and we were also able to stock our kitchen from the nearby Coop grocery store. Loved it! What an amazing place! We have just enjoyed a wonderful week in the tranquil setting of Villa Segale, together with our son and daughter and 4 of their young children, ranging in age from from 4 years to 10. A fabulous week, mostly spent by or in the pool, with a visit to Florence and Pisa also thrown in. A lovely celebratory ( birthday for me! ) meal one evening in Lucca was perfect and was based on a suggestion in the house information file (Trattoria Canuleia in the City Walls) . Fabulous food and service and a great venue for family meals. Villa Segale is in a wonderful location and has been tastefully restored and modernised without compromising its history as a family house of many many years - it has a really peaceful and welcoming feel about it. Thanks for your kind words. We are so happy to hear that you loved your staying so much! This is really the best reward for us! We look forward to welcome you back for your next vacation. Take care! Beautiful, well appointed and fun. The first night, we had a great meal with Lucia and Antonella, another night, a fabulous meal at Ristorante Lombardo and the last, we had a wonderful lesson on the cooking of Tuscany with Allesandra. She and her friend gave our family much information, joy and delicious food. The rooms and grounds are aesthetically pleasing and the view is breathtaking. Michaela,the property manager was very helpful. We loved cooking, swimming and living in the beautiful villa and visiting Lucca and surrounding areas. We all agreed that we are proud to have Italian roots and that the Italian people are the best. Thanks for your nice words. It's rewarding to hear that you spent such a great time in our villa and that you loved exploring one of the most exciting area of the whole Tuscany. We look very forward to welcome you back! The home and location was everything you could want for an Italian holiday. relax and eat. Each bedroom had it's own bath and was a very nice size. The view is amazing from both the front porch, veranda and pool. You're set above the vinyards there and looking down upon Pisa and Lucca. It was convenient to many of the things you would want to do during your visit; Florence, Pisa, Cinque Tere, wine tasting, even Rome (but that is a long, long day). The Owner Marco and House Manager Michela were wonderful, if you needed assistance they were very responsive and helpful. There's a house book that has many wonderful tips on where to eat, shop and go but if you needed help with anything she was certainly a great resource. I would definitely recommend the personal chef Antonella. We had her come in 3 times during our visit and the food was the best we had in Italy. A magical evening for you and your guests! To sum it all up.......just Wonderful. If I go back to that area again I would certainly stay there again because I couldn't imagine any better . Thanks for sharing your wonderful experience! This is a great reward for all the efforts, time and energy that we constantly put into this beautiful place. It's truly rewarding to know that you brought home with you all these great memories of your Tuscan holiday. We really hope to welcome you back again; take care! Our stay was spectacular!! The house was so beautiful with amazing views. Elisabetta cooked us delicious meals that were better than the restaurants. Marco and his family treated us like family. It was truly an amazing experience for my wife and I, it was sad to leave. The location of the house is perfect to visit so many different places in Tuscany. You will not be disappointed, highly recommended!! Thanks for sharing your experience. We are glad to hear that you loved so much our place as well as the wonderful Tuscany! The villa is indeed a great base for visiting the most beautiful places in Tuscany. We are happy to know that you felt part of our family: this means a lot to us. We look forward to welcome you back one day. Take care! This villa was beyond all of our expectations. As beautiful as the pictures are they cannot capture the true beauty of the villa and its surroundings. In addition, the owner, Marco, and his staff are simply amazing and so accommodating. There were 6 of us staying here and we were all so impressed with every single aspect and attention to detail. We will definitely come back in the near future and we highly recommend this location. Thanks for your appreciation. We are glad to hear that you loved so much our place! We look forward to welcome you back one day. The villa is located in a very strategic position that allows his guests to discover all the most important areas of Tuscany and Liguria (Portofino and Cinque Terre). Lucca is an marvelous historycal medieval city that offers fascinating sightseeinsg, restaurants and shops. Viareggio and Forte dei Marmi (with their famous beaches), Pietrasanta (centre for sculptors from all over the world), and Pisa (with her famous pending tower), are all 20-30 minutes away by car. Florence, Chianti, San Gimignano, Sienna, Maremma, Cinque Terre and Portofino are all 1-2 hours away. Be ready to discover the fascinating gems of Tuscany!